A new and more innovative digital transport mobile application, Enshika, has been launched to offer convenience to commuters. Enshika operates with or without Internet or smartphones in order to cater for the transport needs of people with different income levels and living standards. Enshika, which means “my money” in Ga, is an indigenous transport business operating in six regions -- the Greater Accra, Central, Ashanti, Western, Volta and Brong Ahafo. The Chief Executive Officer (CEO) of Enshika, Mr Deepak Sachdeva, said at the launch of the product on November 22 in Accra that Enshika was a 100 per cent Ghanaian brand. He said its mode of operation also made it the first and only service in Western Africa and the sub-Sahara. “Our aim is to have the transport service available at the doorstep of every Ghanaian regardless of their economical standing, social status or educational level. We didn’t want to come in as another service into the market without being sensitive to the need of our own people, where they feel rewarded and are able to save more,” he said. Mr Sachdeva said Enshika was not just designed to offer transport services but to also serve as a lifestyle app that covered a 360-degree aspect of a person’s daily life. The app, he said, offered users convenience in paying their utility bills, school fees and other special packages. “We always believed that the traditional transport sector needed a level playing field to operate and compete among private players and not be left out,” he said. He affirmed Enshika’s readiness to conquer the transport markets in Ghana and the African continent as a whole. “Enshika has come to stay; Enshika has come to make captains take pride in their chosen profession, Enshika is giving passengers numerous reasons why they should patronise the brand. “Enshika is surely taking Ghana across the shore of West and other parts of Africa, which will give Ghana the ability to be a Pan African brand,” he added. The Country Manager of Enshika, Mr Ebenezer Osei, outlined the features and benefits of the mobile app. He said the Enshika App, with its numerous features, was expected to give riders and captains (drivers) value for money. The App has Enshika points, pass systems, fuel on credit, SOS emergency response and the USSD short code option, among others. Enshika points rewards clients for each time the app is used. With these points, customers can convert into monetary value and use it to make purchases at selected grocery shops, restaurants, clubs, pubs and hotels. The daily, weekly and monthly passes give captains zero per cent commission, 100 per cent revenue on trips. Captains will enjoy as much as they earn from their routine trips after acquiring passes from the Enshika company. Riders and captains on the Enshika App have the rare opportunity of accessing fuel on credit, payable at the end of every day. Enshika is highly concerned about the safety of riders, captains and clients. For this reason, the app has an SOS emergency system which is linked to the Ghana National Fire Service (GNFS) and the Ghana Police Service to ensure safety in times of danger. The Ghana Post GPS system also comes in handy to access live locations in order to salvage such unfortunate situations. Unlike its competitors, Enshika has the USSD short code option, aimed at enabling users to book rides without using the Internet. “We have introduced a unique feature which is a USSD short code to help you book your ride with your “yam” phone. 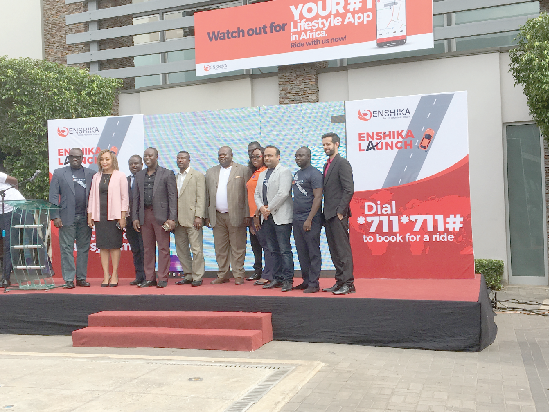 You just have to dial *711*711# on all networks to have access to an Enshika ride”, Mr Osei said. Other features include Permanent Disability cover, which caters for the wives of captains who are rendered disabled in the course of their work and 4 other children. There is also the Vehicle Insurance cover, as well as the temporary disability cover, which takes care of minor injuries sustained by captains through accidents and other work hazards. The “Work and Pay” plan also gives captains the chance to own their cars after taking 150 or more trips. There are also flexible and convenient payment platforms on trips, with partners such as Mobile Money services, Ecobank, Fidelity and other selected financial institutions. The Member of Parliament (MP) for Okaikwei North Constituency, Mr Ahmed Arthur, tasked operators of the system to exercise the necessary checks to ensure riders and captains do not take undue advantage of the numerous privileges available to them.